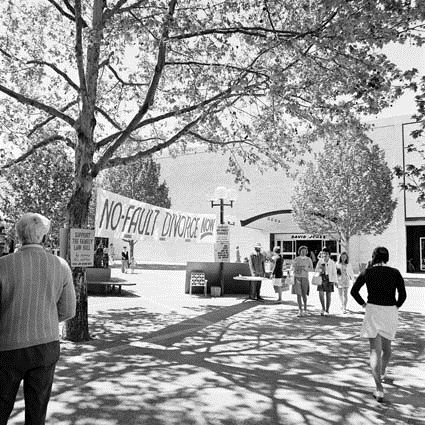 The Whitlam Government enacted a wide range of reforms that expanded the democratic rights and freedoms enjoyed by Australian citizens. His government extended franchise, removed inequalities in the electoral system and established The Law Reform Commission and the Family Court. Collectively, these reforms are an embodiment of Gough Whitlam's guiding principle of 'contemporary relevance', delivering greater coherence between the laws governing Australia in the seventies, and the reality of life at that time. The legacy was profound and shapes life today. By enacting the Commonwealth Electoral Act 1973, Whitlam lowered the voting age from 21 to 18. This legislation also allowed citizens as young as 18 to run for parliament. There was an important ethical dimension to this reform. Until this time, it was possible for Australians to be conscripted into national service, without having the right to vote for or against the government that had conscripted them. Gough Whitlam had a long-held objection to the inequalities created by the Australian electoral system. Prior to the Whitlam Government's Commonwealth Electoral Act (No. 2) 1973, it was possible for the number of voters in an electorate to deviate up to 20% from the average number of voters per electorate. This allowed large inequalities in representation to develop. In 1968, for example, there were some electorates with over 87,000 voters but other electorates with fewer than 47,000 voters – yet each were represented by a single member of parliament. In 1974, for example, there were 83,941 voters in the outer western Sydney seat of Mitchell, but only 46,975 in the rural seat of Darling. This 'diluted' the votes of citizens in outer-suburban areas. This disadvantage was compounded by the irregularity with which electorate boundaries were adjusted to take account of population changes. Electorate redistributions were failing to keep pace with the rapid growth in population in areas like Western Sydney. The Commonwealth Electoral Act (No. 2) 1973 was passed during the 1974 joint sitting of Parliament, having previously been rejected several times by the coalition-controlled Senate. This law halved the maximum allowable deviation from the average number of voters per electorate. It also required the Electoral Commission to take into account population trends when drawing up electoral boundaries.These changes made the electoral system more representative, reduced the 'dilution' of votes through unfair electorate distributions, and ensured that each vote had an equal value. On August 7, 1974, The Whitlam Government's Senate (Representation of Territories) Act came into effect.235 This meant that for the first time, citizens in the Australian Capital Territory and the Northern Territory were represented in the Senate, by two senators each. By passing the Northern Territory (Administration) 1974 Act, the Whitlam Government created a Northern Territory Legislative Assembly composed of 19 elected members. This replaced a body composed of a mixture of appointed officials, public servants and elected members. In passing the Family Law Act, 1975, the Whitlam Government ushered in a major change to divorce law in Australia. Before the passage of this legislation, a marriage could only be dissolved if one party could prove that the other was at fault in the breakdown of the marriage. ‘Matrimonial offences’ such as adultery, cruelty or ‘desertion’ had to be proven before divorce could be allowed. These things, according to Whitlam, were symptoms, rather than causes of marriage breakdown. The indignity of the existing process was compounded by its very public nature – divorce proceedings were conducted in the Supreme Court and became fodder for gossip columns in newspapers. Moreover, the financial cost of this fault-based court process was prohibitive to many. According to Whitlam this system was one which ‘promotes indignity, bitterness and hostility in the course of proceedings. Whitlam argued that the process also reduced the chance of the parties having any sort of workable relationship after divorce, and that this was against the interests of any children the couple may have had. There was vocal opposition to this reform. Some argued that it would increase marriage breakdown and relationship instability, while others argued that it would encourage promiscuity and destroy the institution of marriage. However, these were minority views. At the time the laws were introduced, public support for them ranged between 60% and 75%. The Whitlam Government passed legislation enacting the reform on June 12, 1975. Once the laws were enacted, a couple had only to show that their marriage had suffered an irretrievable breakdown – a separation of twelve months – in order to become divorced. The parties could continue to reside at the same address but be defined as ‘separated’. The law abolished the requirement that blame be assigned in order to dissolve the marriage. The Family Court was established as the dedicated legal forum for resolution of family law matters through the Family Law Act 1975. It was formed to provide a less adversarial forum for the resolution of cases concerning family law. It was structured to foster an informal, supportive atmosphere with proceedings based on the notion that family law matters should be perceived as matters of inter-personal relationships, rather than morality. The Family Court’s resolutions were to be informed with input from social science experts and social workers and an in-house counselling service was structured into the court. These features were designed to move the administration of family law away from a model which primarily sought to assign blame in interpersonal relationships. The Family Court continues to function as a specialist court for the administration of family law in areas such as divorce, property, custody and child support. The Law Reform Commission was created by the Whitlam Government in order to provide future governments with the informed recommendations regarding Australian law reform. On Attorney-General Senator Lionel Murphy's recommendation, Justice Michael Kirby was appointed as the first chairman of the Commission. The organisation continues to function today, conducting research and consultation to investigate and propose changes to the law that bring it into line with 'current conditions and needs', that simplify the law and remove defects in it, improve access to justice, or make the administration of the law more efficient. "I see the role of the Australian Legal Aid Office as taking the law to the people who most need it. I want to see small unpretentious "storefront" offices opened up in the suburbs of the cities and in country centres. I want them to be the kind of offices to which the ordinary man or woman faced with a legal problem will go as readily as he or she would go to the garage with an ailing motor car…I believe that there is not only scope but a clear need for legal aid offices that are spread throughout Australian where need is greatest; offices that are staffed by salaried lawyers and that serve as a centre of legal aid activity". Offices were opened in each state capital, as well as Darwin, Canberra, Blacktown, Ipswich, Burnie, Sunshine, Fremantle and Elizabeth during the first year, with more to follow later. By 1975, the Australian Legal Aid Office was the largest legal aid service in the country. The Whitlam Government also contributed significant financial support to community legal centres, state-based law society programs, and Aboriginal law services. The funding directed to legal aid services tripled during the tenure of the Whitlam Government.